After a really great movie ends and the credits roll, you might be tempted to head out of the theater or stream something else, but it might be a good idea to wait around. Plenty of movies hide a little something extra (or a few extra things) before, during, or after a film's credits, as a little reward for those who wait around and give each and every person who worked on the film the due they deserve. The idea of a post-credits sequence certainly isn't new — some films in the 1960s and '70s notified viewers of upcoming sequels or just let the characters continue the action under the credits themselves — but in recent years, credits scenes have seen a serious boom thanks to superhero films, especially those of the Marvel Cinematic Universe, which use these quick codas to tease upcoming characters, advertise future films, or just add in one last joke. While they may have perfected the formula, though, Marvel's not alone. From The Avengers to Anchorman, here are some of the best end credits scenes ever. Marvel has laid claim to a majority of the great post-credit scenes, but perhaps the best one of them, somehow, gives away no new information while satisfying audiences with pure entertainment value alone. The original Avengers film, written and directed by Buffy and Firefly creator Joss Whedon, finally brought several heroes of the Marvel Cinematic Universe together to protect Manhattan from Thor's conniving brother Loki and the Chitauri, an alien race trying to overtake Earth. During the final battle, Tony Stark nearly sacrifices himself but survives, leading to plenty of high-quality banter between him and his colleagues, with Stark suggesting that once the skirmish is over, they grab a bite at a little shawarma place he spotted in Midtown (he doesn't know what it is, but he wants to try it). 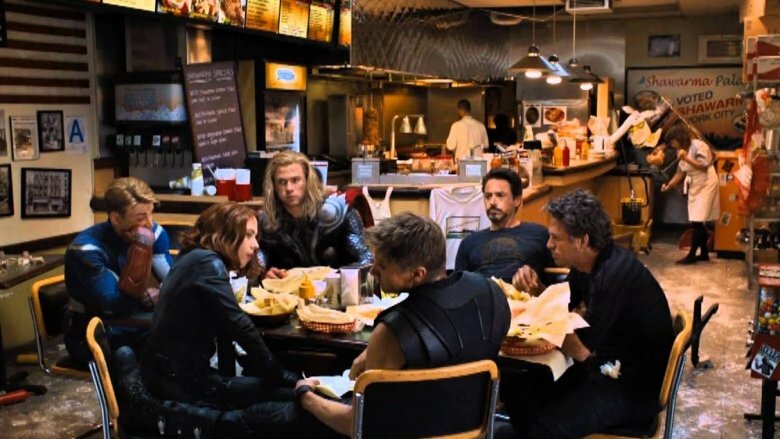 As you might expect, once the credits finish, you're treated to a scene of all of the Avengers silently eating shawarma in a completely wrecked restaurant after the battle. The scene was shot long after the film initially wrapped thanks to script changes and a brainwave by Whedon, giving the entire sequence an unexpectedly rich backstory. 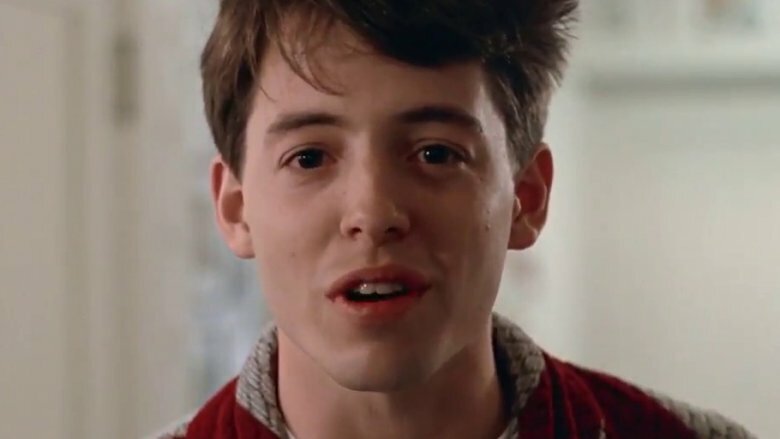 John Hughes is responsible for some of the most beloved teen films of all time, including The Breakfast Club, Sixteen Candles, and, of course, Ferris Bueller's Day Off, the definitive hooky movie starring a young Matthew Broderick as the titular young troublemaker. Ferris decides to take a day off from school, escape the monotony of the Illinois suburbs, and explore Chicago with his hesitant best friend Cameron (Alan Ruck) and his adventurous girlfriend Sloane (Mia Sara). Thanks to Ferris' ingenuity and several instances of flat-out good luck, the gang gets away with (almost) all of their plans (even though Cameron now has a wrecked car to deal with). Throughout the film, Ferris repeatedly breaks the fourth wall and speaks directly to the audience, charming then with his musings on his relationship with Sloane or by telling them they should definitely pick up a Ferrari if they can. If audiences wait around until the very end, they're treated to one final fourth wall break. After the credits, Ferris appears in his bathrobe, telling the audience that the movie is over and they should all go home, providing the perfect coda to this quirky film. From the very start of Deadpool, audiences know they're in for a sarcastic ride, considering that the opening credits themselves omit any real names in favor of jokes like "Starring God's Perfect Idiot" (referring to star Ryan Reynolds) and "Directed by an Overpaid Tool" (referring to director Tim Miller). A Marvel superhero film about a mercenary turned mutant who undergoes experiments to cure his terminal illness and ends up scarred and mutilated but possessing new powers, Deadpool single-handedly revived Reynolds' flagging career and introduced a new generation to the sardonic, red-suited superhero with the driest wit around. Ultimately, this underdog of a movie became the highest-grossing R-rated film of all time and the ninth highest-grossing film of 2016. Deadpool gains plenty of abilities once he becomes a mutant, and one of them seems to be awareness that he's in a film. This gives the filmmakers a perfect opportunity to reference another wise-cracking fourth wall breaker. 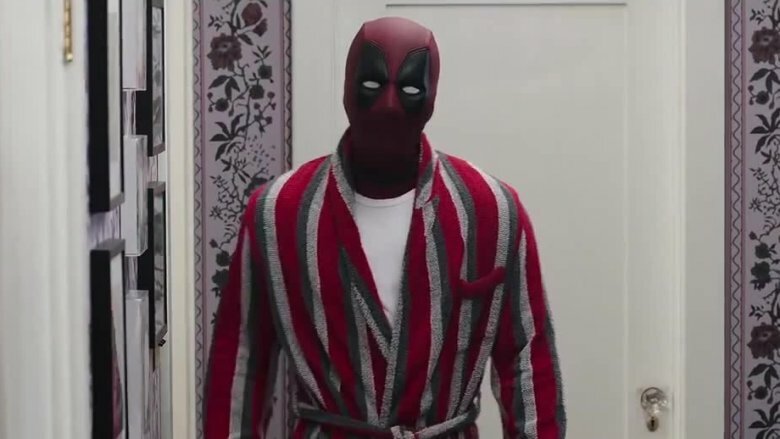 After the credits, Deadpool comes back for one last bit, wearing Ferris Bueller's bathrobe and wandering around an exact replica of the house from Ferris Bueller's Day Off, mocking the audience for expecting more from a post-credits scene, eventually admitting that Cable will appear in the next film. Considering the similarities between the two films, there's no better reference, and it's the ideal way to close out a movie as irreverent as Deadpool. An unlikely success, the 2004 comedy Napoleon Dynamite certainly didn't seem like a movie that would eventually attract a huge cult following and become a part of the pop culture lexicon. Jon Heder stars as Napoleon himself, a weird, offbeat teenager with a monotone voice and a disgruntled air who gets bullied in school for being unafraid to completely be himself, despite his unpopularity. He also has to deal with his bizarre brother, Kip, who lives at home with Napoleon and their grandmother (despite being in his early 30s) and spends his time bragging about his internet girlfriend and his cage-fighting skills, though both of those seem pretty suspect. Kip even embarks on a "get rich quick" scheme with Napoleon to try and go visit his presumably imaginary girlfriend, LaFawnduh. Audiences, along with most of the characters in the film, are shocked when LaFawnduh actually shows up. 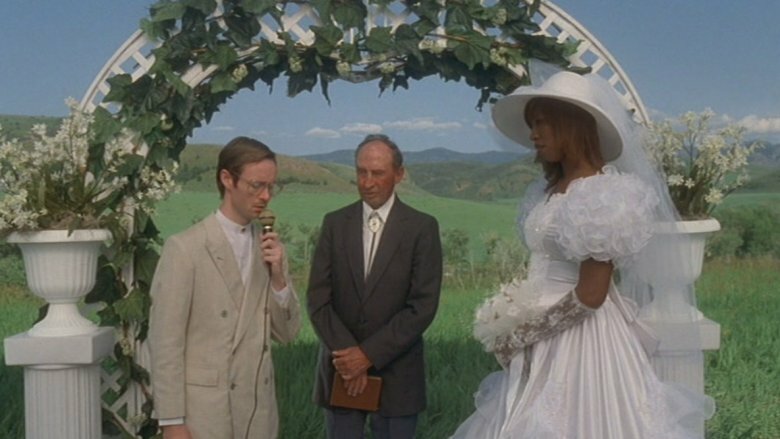 If viewers stick around for the entire final credits sequence, they'll even get closure on Kip and LaFawnduh's relationship, with a short scene of their actual wedding. Napoleon gifts them a "wild honeymoon stallion" and Kip sings a song about his love for both LaFawnduh and the technology that brought them together. A perfect continuation of the awkward weirdness that makes up the rest of the film, it's a fun little scene for viewers to discover upon repeat viewings. One last callback in Airplane! One of the most famous comedies of all time, Airplane! is a pun-filled, slapstick-ridden romp starring Robert Hays alongside a perfectly sharp cast. The movie has lived on in infamy since it was released in 1980, and is still considered one of the most beloved films in its genre. 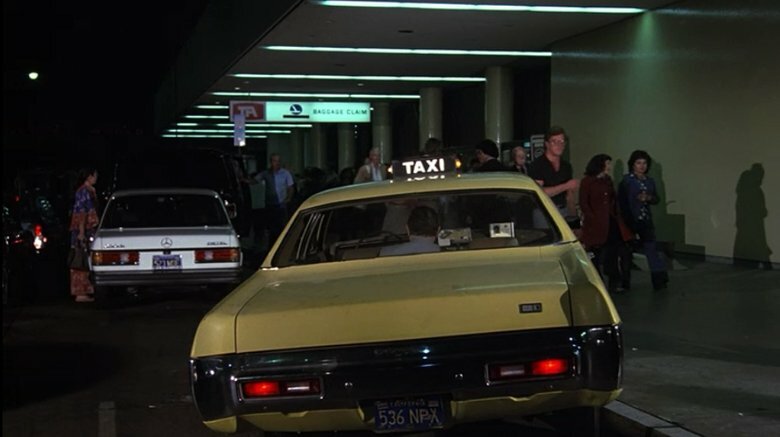 Hays stars as Ted Striker, a war veteran now working as a taxi driver and trying to win back his flight attendant girlfriend Elaine (Julie Hagerty) by boarding one of her flights on a whim. When many passengers and most of the crew end up with food poisoning, Ted, a former fighter pilot, must land the plane. He eventually does so successfully, reuniting with Elaine after a mounting series of absurd, ridiculous mishaps. The film even ends with "Otto," the aircraft's inflatable autopilot, flying off into the sunset with an inflatable female companion. You might forget, as the film proceeds, that Ted abandoned his taxi and the passenger inside when he spontaneously booked his ticket. Not leaving any stone unturned, the film returns to the passenger just after the credits, with the irate man saying, "Well, I'll give him another twenty minutes, but that's it," making for an absolutely perfect callback to finish the film. Throughout most of the runtime of the 2009 horror comedy Zombieland, audiences are pretty sure there are only four people left alive in the zombie-ridden post-apocalyptic world of the film: Columbus (Jesse Eisenberg), a timid, unexpected survivor; Tallahassee (Woody Harrelson), a tough, larger-than-life, bombastic fighter; Wichita (Emma Stone), a protective, tough former con woman; and Little Rock (Abigail Breslin), Wichita's fiery little sister. At one point, the group stumbles across a Hollywood mansion they think is abandoned, but end up making a startling discovery — Bill Murray (playing himself, obviously) is still alive, and has just been dressing as a zombie to "blend in" so that he can roam freely throughout Los Angeles without getting attacked. Unfortunately, Columbus isn't around for this reveal and accidentally shoots Murray in the chest in his own private movie theater, killing the comedy legend. The gang leaves Murray behind and moves on, but after the credits, he and Tallahassee share one more semi-tender moment from his death scene. Tallahassee feebly tries to quote Jean-Paul Sartre (in a direct reference to Murray's classic Caddyshack), with a seemingly dead Murray eventually chiming in to perform it perfectly, giving this sharp, witty zombie comedy the perfect send-off. How Murray ended up appearing appearing in the movie, incidentally, is its own incredible story. Even though the much-maligned 2003 iteration of Daredevil had one of the earliest Marvel post-credits scenes, the tradition really began with 2008's Iron Man, which serves as the first legitimate installment of the Marvel Cinematic Universe. Between Robert Downey Jr.'s outstanding career comeback performance and pitch-perfect direction from Jon Favreau, the film was a smash hit, attracting rave reviews and an outstanding pull at the box office. 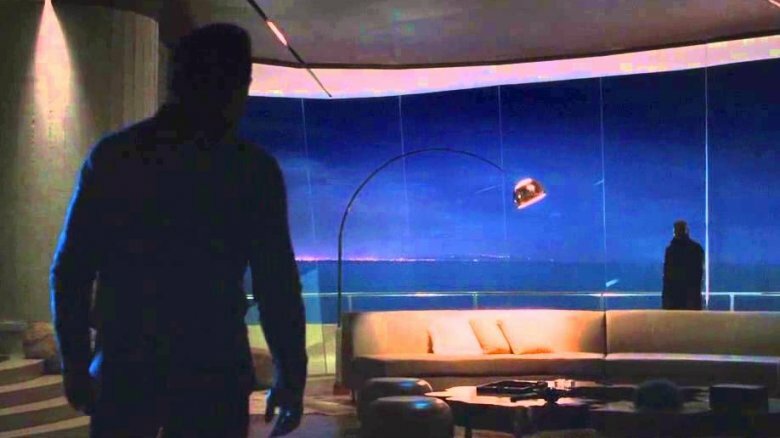 As the launchpad for the MCU, Iron Man had a lot to set up, and it accomplished it in part with one of the most important post-credits sequences of all. 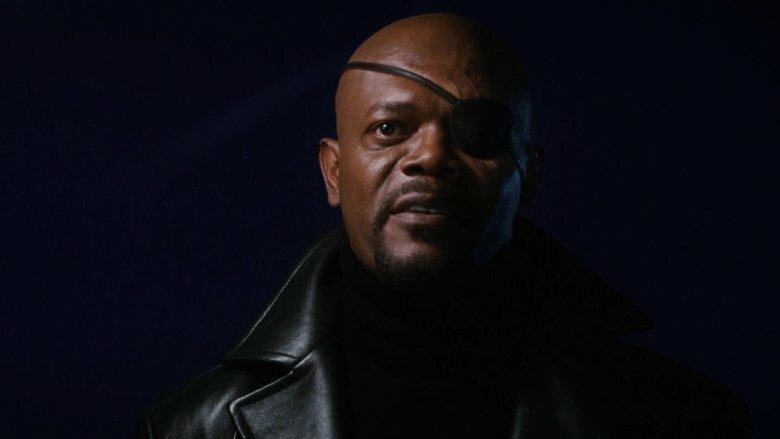 After the credits roll, Nick Fury (a surprise cameo from Samuel L. Jackson) appears to tell Stark he isn't the "only superhero" and that he has come to discuss the "Avenger Initiative," even telling Tony that he's become part of a "bigger universe," which feels pretty on-the-nose where the MCU is concerned. The Pirates of the Caribbean franchise debuted with The Curse of the Black Pearl in 2003, and has since become one of the biggest film franchises of all time, spanning five films that have earned billions of dollars at the box office both domestically and abroad, as well as providing star turns for big names like Johnny Depp, Orlando Bloom, Keira Knightley, Penelope Cruz, Geoffrey Rush, Ian McShane, and more. Though the films have faltered critically with each installment, The Curse of the Black Pearl remains beloved by critics and fans alike, having introduced audiences not just to Depp's infamous Captain Jack Sparrow, but to Bloom's Will Turner and Knightley's Elizabeth Swann, who ended the first film as a romantic couple. However, by the end of the third film in the series, At World's End, the couple has been separated, with Will sailing off on the Dutchman, cursed to remain at sea for a decade, leaving a pregnant Elizabeth behind with only a box containing his heart. A bittersweet conclusion, yes, but if fans of these two wait until the credits are over, they'll be treated to a scene in which Elizabeth and her son, Henry, welcome Will home ten years later, finally giving the family their happy ending. The Fast and the Furious movies make up one of the biggest franchises of all time and the biggest earner for Universal Studios, giving audiences a healthy dose of pure escapism when the real world just gets to be too much. Ever since the first film premiered in 2001, the subsequent seven installments (with more sequels and spin-offs to come) have provided audiences with plenty of car chases, heart-stopping action, and heists galore, relying on a core cast that includes Vin Diesel, Michelle Rodriguez, Dwayne "The Rock" Johnson, Jordana Brewster, the late Paul Walker, and plenty of others. Viewers came to love Michelle Rodriguez's Letty Ortiz, Dom's (Vin Diesel) wife and an equally skilled mechanic and racer, over the course of the series. During the events of the fourth film, Fast & Furious, she goes missing while separated from the rest of the crew and is reported dead. However, just as the credits end on Fast Five, the very obviously-named fifth installment of the franchise, it is revealed that Letty is actually still alive, spotted during a recent robbery of a German military convoy. Not only did this scene give fans their beloved character back and get them excited for the next film in the series, it raised some intriguing questions about what Letty had been up to since her alleged death. 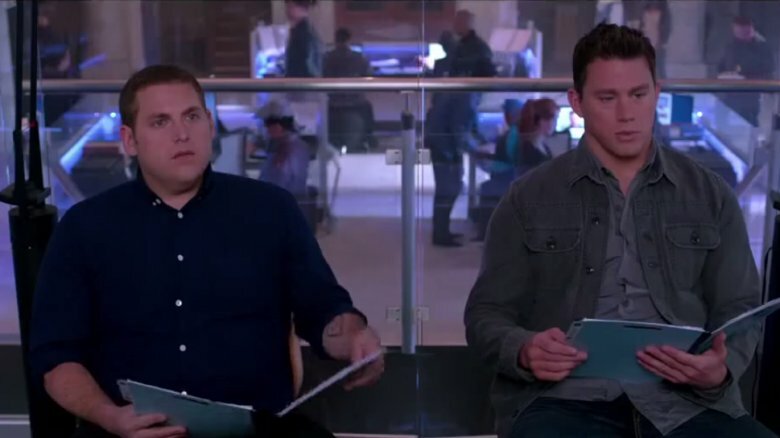 Audiences and critics alike probably groaned when they heard that Channing Tatum and Jonah Hill would be starring in a reboot of the '80s teen cop show 21 Jump Street. This 2012 movie cast the pair as two cops forced to go undercover in high school to infiltrate a drug ring peddling synthetic drugs to teenagers. However, thanks to its tongue-in-cheek attitude, clever script, and winning performances, the film turned out to be a huge success both critically and commercially. It eventually spawned a sequel, 22 Jump Street. In between gags making fun of its own existence, the follow-up put Tatum and Hill in college to investigate yet another drug ring, and fared equally well with critics as well as at the box office. If you loved the first two films in the series and want as many sequels as you can handle, according to 22 Jump Street's credits, you're in luck. As the credits roll, the film cycles through an absurd number of sequels, including 25 Jump Street: A Semester at Sea and 38 Jump Street: Dance Academy. The sequence even features cameos from actors like Bill Hader, Anna Faris, and Seth Rogen (who briefly replaces Jonah Hill for a few of the "films"). In fact, 24 Jump Street (that's right — 24, not 23) might actually be in production, so maybe even more of these fake credits will come true. As the Marvel Cinematic Universe chugged along post-Avengers and more superheroes popped up in their friends' films, it was clear that everyone would eventually get back together for another installment. In 2015, Avengers: Age of Ultron hit theaters, re-assembling the crew with a few additions (including Aaron Taylor-Johnson's Quicksilver, Elizabeth Olsen's Scarlet Witch, and Paul Bettany's Vision). Eventually, after Scarlet Witch stops fighting the Avengers and officially joins the team, they form an entirely new base together, marking a new era for the MCU. Audiences had met Thanos in a post-credits scene after the first Avengers film (in which he was played by actor Damion Poitier). 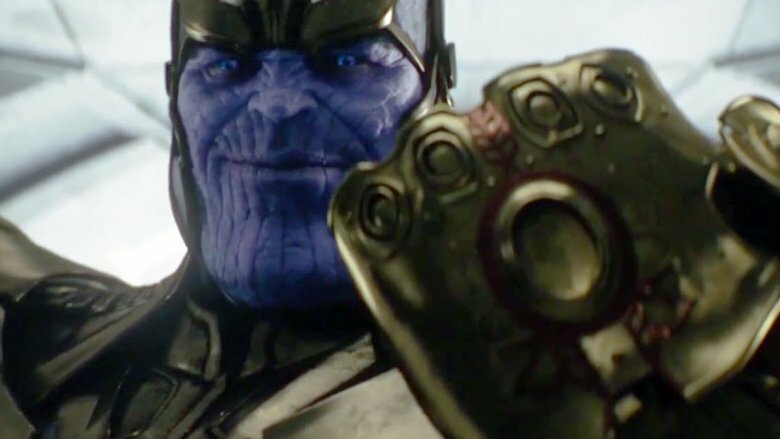 The Mad Titan next appeared briefly in Guardians of the Galaxy, marking Josh Brolin's debut in the role. But it wasn't until Age of Ultron's post-credits scene that the movies truly set Thanos on a collision course with Earth's Mightiest Heroes. He may do nothing more than pick up a gauntlet and announce, "I'll do it myself," but as audiences now know, this has staggering implications that finally become clear in Avengers: Infinity War. One of the most beloved comedies of the aughts, Adam McKay's Anchorman: The Legend of Ron Burgundy has given audiences catchphrases galore and stands the test of time, remaining one of the funniest and most quotable movies in recent history. Starring Will Ferrell as Ron Burgundy, the titular anchorman, alongside a news team made up of Paul Rudd, David Koechner, Steve Carell, and Christina Applegate (who plays Veronica Corningstone, his lover-slash-nemesis), this perfectly absurd film produced so much leftover footage of improv and cut jokes that an entirely new movie could have been made. 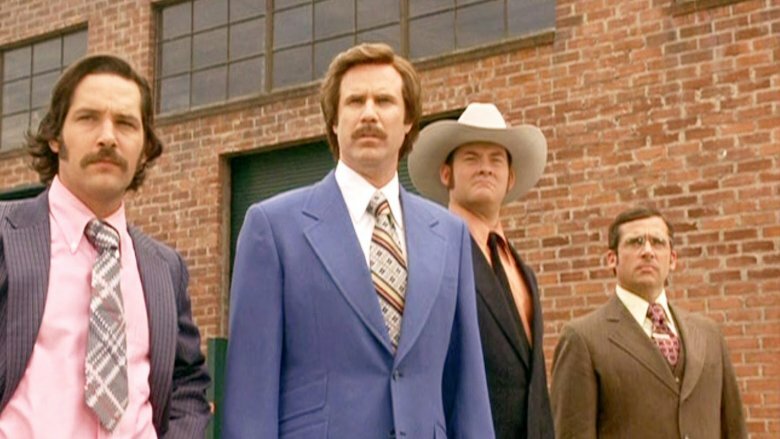 In fact, it was, in the form of a DVD extra titled Wake Up, Ron Burgundy: The Lost Movie, which predates Anchorman 2 and centers on the news team's efforts to expose a bank robbery plot. With this much leftover footage, it's no surprise that the credits are chock-full of bloopers, cut scenes (including a fan favorite about Brick Tamland's golf tournament), and even bloopers from other movies. You might not think there would be anything left for a post-credits sequence, but wait around and you'll see Burgundy and his news team having a laugh and talking about how much they're laughing and how much they like each other. It's perfectly dumb, perfectly performed, and a perfect final note for this truly weird film. 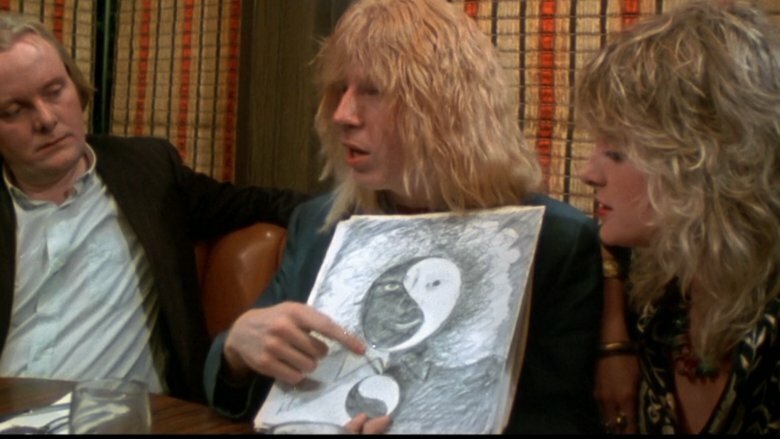 This Is Spinal Tap, one of the defining mockumentaries and comedies of all time, focuses on a fictitious band called Spinal Tap (even their name, which refers to an incredibly painful medical procedure, is patently absurd). The movie, released in 1984, was directed and co-written by veteran Hollywood staple Rob Reiner, also known for other classics like The Princess Bride and When Harry Met Sally, among others. Cult comedy favorites Michael McKean, Christopher Guest, and Harry Shearer star as the band, with Reiner appearing as the documentarian following them on tour. From incorrectly sized Stonehenges to exploding drummers to the band literally getting lost on their way to the stage, the film is packed full of classic moments beloved by fans, and is still ranked as one of the best films of all time. For a movie so full of great jokes already, it seems like an amazing gift to provide fans with even more footage, but Reiner and his crew do, with yet another interview rolling under the credits. Here, the band imagines what their epitaphs might be — for example, David St. Hubbins (McKean) says his would be "Here lies David St. Hubbins, and why not?" Is there a better way to end such an absurd comedy than with a discussion of tombstones? 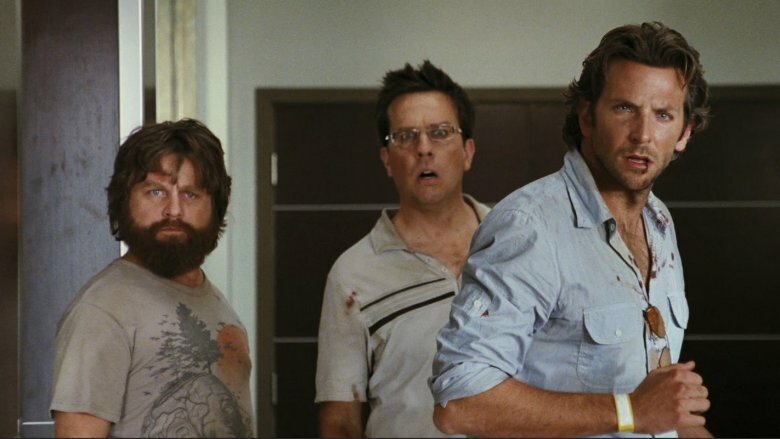 The premise of The Hangover — a raucous, raunchy comedy starring Bradley Cooper, Ed Helms, and Zach Galifianakis — is exactly what it sounds like. Three men desperately try to connect the dots after a long night of drinking in Las Vegas in hopes of finding their missing friend Doug, who is supposed to get married in California the very next day. As the trio search through the city for clues about where the groom might be, they run into everyone from policemen to doctors to strippers to Mike Tyson, each of whom provides a small piece of the puzzle. Still, the entire evening never really comes together; though they eventually find Doug badly sunburned on the hotel's roof, they go home thinking they'll never really find out what happened on that fateful night. However, as the wedding takes place and the end credits roll, the three finally find a digital camera containing evidence of everything they did that night, which they agree to delete so nobody can ever see it again. Luckily for audiences, the photos appear during the final credits, and each character (except for Galifianakis' shameless Alan) is horrified by what they see. For the audience, piecing the night together along with the characters themselves makes for a satisfying curtain call. Audiences who loved Guardians of the Galaxy were likely extra pleased during the final credits of the first film, which feature two brief sequences chock full of more jokes. An irreverent and wholly quirky superhero adventure, Guardians leaned into its offbeat sense of humor, letting characters like Star-Lord (Chris Pratt) and Rocket Raccoon (voiced by Bradley Cooper) riff on each other to a soundtrack of '70s hits by artists like David Bowie and The Jackson 5, all while delighting audiences and critics alike and performing admirably at the box office. 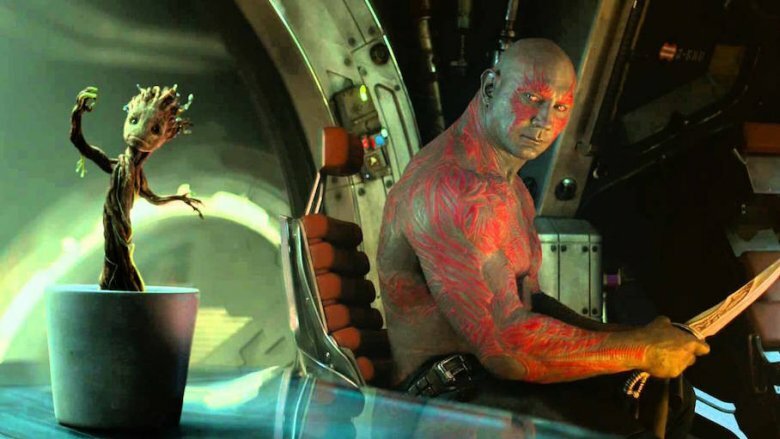 The first end credits sequence features everyone's favorite tree, Groot (voiced by Vin Diesel), reborn as a sapling and dancing along to "I Want You Back" while closely watched by Drax (Dave Bautista). But the film wasn't finished treating its fans. At the very end of the credits, Taneleer "The Collector" Tivan (Benicio del Toro) is seen surveying his damaged showroom, left only with an astronaut dog (a cameo from comic book canine Cosmo) and none other than Howard the Duck, a character with a complicated history who happened to headline the ill-fated first-ever Marvel movie in 1986. Neither of these moments really advance the plot, but after several super-serious post-credit scenes, they felt like a welcome reprieve. A hallmark of the Iron Man movies is Tony Stark's biting wit, and with Iron Man 3 helmed by Shane Black — known for his sharp, witty scripts and direction to match — people could expect plenty of that. In the film, Tony is struggling to deal with the after-effects of The Avengers. His flashbacks to the traumatic Battle of New York complicate his relationship with Pepper Potts (Gwyneth Paltrow) and make it difficult to face an onslaught from a mysterious terrorist known as the Mandarin (Ben Kingsley). Though other Avengers are largely excluded from the film (aside from Don Cheadle as Tony's confidant Rhodey, a.k.a. War Machine, a.k.a. Iron Patriot), one other teammate shows up for a humorous post-credits sequence. 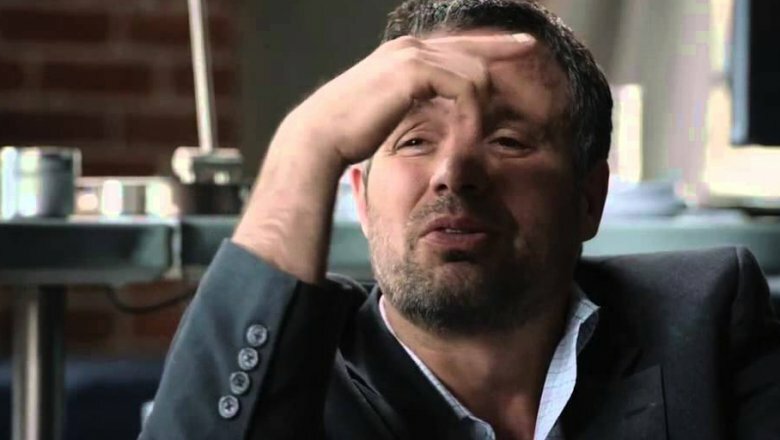 As the credits end, audiences can hear Tony wrapping up the story in conversation with some sort of therapist, who turns out to be none other than Dr. Bruce Banner (Mark Ruffalo). Banner, who has fallen asleep during Tony's story, protests that he's "not that kind of doctor" and doesn't have the "temperament" to be a therapist. True to form, Stark presses on regardless, continuing to pour his heart out to an unwilling Banner in a perfectly charming and funny final scene.